Following the success of ‘An Evening With The Swedish Synth’ last March, Nordic friendly blog Cold War Night Life have announced their next live event ‘A Secret Wish’ on SUNDAY 19TH APRIL at The Lexington in London. No2 in an occasional live series, the event again has a Swedish flavour and is headlined by SISTA MANNEN PÅ JORDEN (SMPJ). Also on the bill are VILE ELECTRODES while making a special DJ appearance will be acclaimed producer JOHN FRYER. ‘An Evening With The Swedish Synth’ was one of the best of the best live events of 2014 and a fine example of what could be achieved when an electronic event was actually curated by an electronic music enthusiast. With the dedication and care that Cold War Night Life take with their projects, ‘A Secret Wish’ promises to be one of the must attend events on the synthesizer calendar. What would you say is the ethos of the Cold War Night Life blog? The site’s tagline is “electronic music and culture”, but we’ve covered everything from Moog 50 to 23 SKIDOO via William Orbit’s spoken word show. If it’s good, it is worth talking about, so we are open to a guitar artist like JENNIE VEE but don’t cover most EDM. That said, when a DJ like Sandra Mosh or a techno artist like YOUR SILENT FACE does something special, we’re there. From the beginning, it has been inspired by little touches: the care that Vinyl-on-Demand put into their box sets or the choice of reverb on a snare by PARRALOX. Their attention to detail is what makes them interesting and pushes us to keep up. How did you get into electronic pop music? KRAFTWERK’s ‘Autobahn’ and ABBA’s ‘Voulez-Vous’ were milestones, but GARY NUMAN performing ‘Cars’ on ‘Saturday Night Live’ in 1979 turned everything upside down. When JOHN FOXX’s ‘Metamatic’ and OMD’s ‘Organisation’ arrived, there was no turning back. As a teenager, I started working in record shops, managing a local synth band, producing a cable TV show and writing about the music that was coming from Europe. To this day, I can’t recognise Top 40 hits from the commercial radio of that time, because I was so wrapped up in the sounds on the first two HUMAN LEAGUE albums. 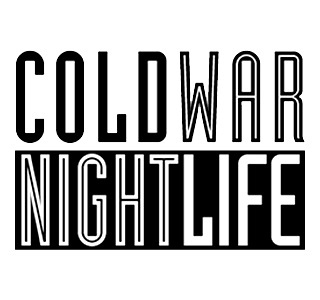 Cold War Night Life is named after the debut album of Canadian band RATIONAL YOUTH. Why has this particular band inspired you and how do you equate their standing in the history of synthpop? RATIONAL YOUTH are from Montréal, which is the most European of Canadian cities and was the first to absorb the synth music of the 70s, like KLAUS SCHULZE and CLUSTER. It was the right place for a couple of electro-pioneers to find each other. When RATIONAL YOUTH released ‘Cold War Night Life’ in 1982, they were easily on the same plane as OMD, JOHN FOXX or DEPECHE MODE. Bill Vorn had a System 100 and Tracy Howe programmed sequencers using equations, but their songwriting was also world-class.They were on a tiny local label, so they didn’t have the commercial reach they deserved, but wherever the record landed, it launched more bands. When RATIONAL YOUTH toured Sweden last year, hundreds of people were singing along in three different cities, which all grew from one person getting a vinyl copy in 1982 and copying it for friends – a rare example of home taping nurturing music. The choice of name was in tribute to the legacy of that record and the spirit that created it. Canada is doing very well with new electronic acts such as AUSTRA, GRIMES, TRUST, PURITY RING, ELECTRIC YOUTH, CHROMEO and LOLA DUTRONIC. What do you think of these artists? It’s great that there are so many new artists coming through – and not just followers of RUSH and NICKELBACK! I actually learn about a lot of these bands through TEC, but the one that both confounds and interests me most is TRUST. How did you get into the Swedish side of things? I did a university degree in Stockholm and discovered a vein of music that is still to be mined properly. Bands like RATATA and NASA made amazing music but are not well known outside of the country. They lived in ABBA’s shadow. We have some great Swedish contributors, who are enthusiastic about music and sharing their discoveries. It means that we get can get a story about a new band that has just debuted at a local café, which can be more interesting than a report on the most recent tour by a big name act. I’ve been asked this question… so what’s so special about Sweden then, and which acts do you rate? The Swedish synth scene is incredibly loyal. It hasn’t changed with fashion, so it has been possible for artists to grow together with the scene. That has given a long life to acts like LUSTANS LAKEJER, TWICE A MAN and PAGE, while fostering terrific artists like ALISON, EMMON, JULIAN & MARINA and THERMOSTATIC. The bands that Eddie Bengtsson has written for are all very special, because his songs are so good: PAGE, S.P.O.C.K. and SISTA MANNEN PÅ JORDEN. KORD and ACUTE ONSET are two current acts I’d love to see live. Cold War Night Life’s first live event was ‘An Evening With The Swedish Synth’ with PAGE, MACHINISTA and TRAIN TO SPAIN. How do you look back on that event and how it was received? The idea was to give Londoners a view of the current Swedish scene and a chance to connect with it. PAGE are still very current, but originally go back to the early 1980s. MACHINISTA and TRAIN TO SPAIN represent the new generation. The event was successful: TRAIN TO SPAIN got picked up by a label on the night, while a lot of musicians checked it out. The local crowd was very welcoming, which gave it a good vibe. Your next event ‘A Secret Wish’ has a Swedish flavour in SMPJ but also, looks closer to home with VILE ELECTRODES and JOHN FRYER? Were there any particular reasons for the change in concept? JOHN FRYER lives in Oslo, so we couldn’t pair him with SMPJ and call it a Swedish Synth event. VILE ELECTRODES are perfect to match with SMPJ, because they are fearless and have immaculate analogue credentials. How did you come to your chosen line-up? JOHN FRYER made ‘Speak & Spell’ and ‘A Broken Frame’ – he sat in the studio with Eric Radcliffe and Daniel Miller, working out how to get the sounds on tape in that magical way. He also produced FAD GADGET and COCTEAU TWINS. John’s DJ set is going to focus on his work for 4AD and Mute. When a member of THIS MORTAL COIL is playing the music he has worked on at two of the most distinctive labels, in his own mix, you know it’s going to be special. SMPJ are legendary in Sweden, because their music is so catchy. Their sound is somewhere between GIORGIO MORODER and SPACE, rebooted for the 21st century. VILE ELECTRODES are a great fit, and they showed at TEC003 that there is really no-one in the UK who can touch them. The secret wish is to see them all on the same stage. For those who are undecided, what can they expect from ‘A Secret Wish’? Half-decent music. OK people. Alright beer. Some understatement. Any chance of Cold War Night Life’s playing host RATIONAL YOUTH for No 3 in your occasional live series? I would love to see RATIONAL YOUTH in London, and would be happy to be a part of making that happen. What next for Cold War Night Life or yourself in terms of music related projects? There is a RATIONAL YOUTH tribute album in the pipeline. The main focus, of course, is on sharing the stories that go with the music.